This is the ubiquitous inexpensive modern hyacinth vase. The lowest price I've seen is 10p in a charity shop but at a car boot sale a seller gave me one just to get rid of it at the end of the day. It's utterly boring but functional. Sizes of this selection of modern vases varies. The standard clear vase (right towards back) is 14.5 cm tall. The greenish one (front right) is 12.5 cm tall. The greenish uranium vase (left) is 16 cm tall. The tall Menu vase at the back is 27.5 cm tall and the glassroots red vase on the left is 20.5 cm tall. I believe these are from the 1950s. 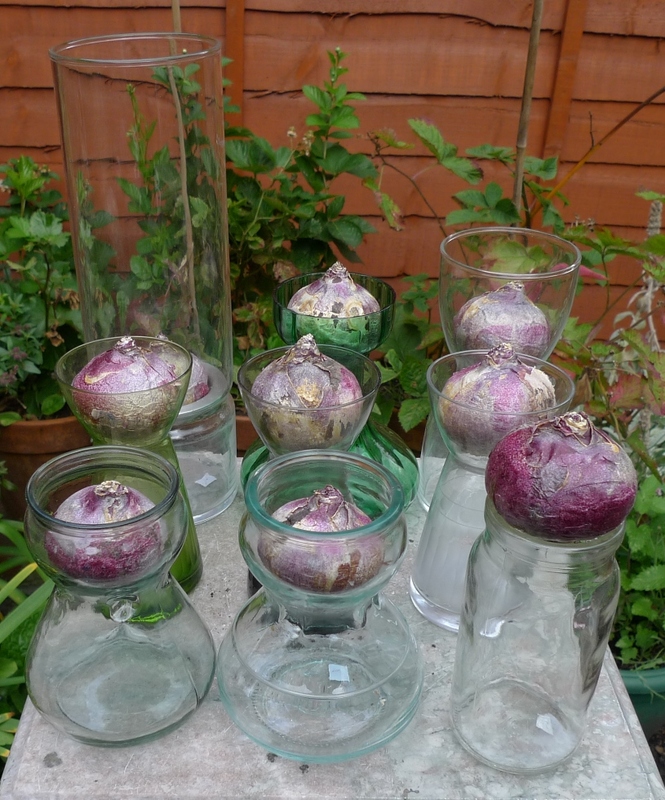 A few years later I have a different selection of modern hyacinth vases (shown below), due to selling some, giving away some, being given some and buying some. I still have the Menu vase, back left. I was given the M+S vase, back right. I bought the "dimpled" vases, front left and the candy jar, front right is a good example of using non-hyacinth vases to force hyacinths. I'm just getting these ready to go into the cellar for this year's forcing (2014/2015). 2016 and I see a new modern hyacinth vase (clear on the left from Ravenhead Naturals) that I thought might be worth trying. I show it here compared to 2 other classic hyacinth vase shapes.